Yep it's that day of the year again, June 6th! Today marks the 74th anniversary of the Allied amphibious landing in Northern France which led the way for the liberation of Western Europe from German occupation. Of course today is also the anniversary of the Red Alert 2 mod D-day, which has now been in development for 16 years. 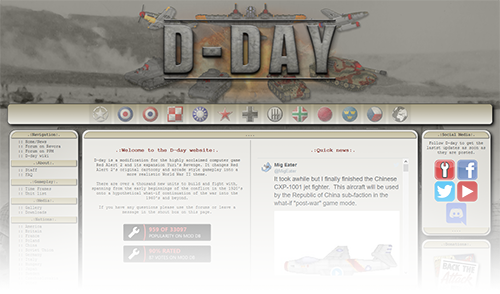 To celebrate I have completely redone the D-day website with a new look and features. I plan to continue working on the new site to add more information and content in the coming weeks, which I'll post updates about on D-day's Facebook and Twitter pages. In addition to the new website I have also created a Discord chat server for D-day. I will be there as much as I can, so feel free to join in and ask me any question you may have about D-day.